For ither uises, see Andrea Doria (disambiguation). For the Italian ocean liner, see SS Andrea Doria. 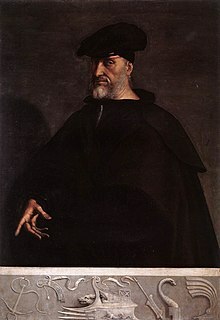 Andrea Doria (or D'Oria) (30 November 1466 – 25 November 1560) wis a Genoese condottiero an admiral. Doria wis born at Oneglia frae the auncient Genoese faimily, the Doria di Oneglia branch o the auld Doria, de Oria or de Auria faimily. His parents wur relatit: Ceva Doria, co-laird o Oneglia, an Caracosa Doria, o the Doria di Dolceacqua branch. Orphaned at a early age, he became a sodger o fortune, servin first in the papal gaird an then unner various Italian princes. In 1503 he wis fechtin in Corsicae in the service o Genoa, at that time unner French vassalage, an he teuk pairt in the risin o Genoa against the French, wham he compelled tae evacuate the ceety. Frae that time onwairds, he became famous as a naval commander. For several years he scourt the Mediterranean in command o the Genoese fleet, wagin war on the Turks an the Barbary pirates. Wikimedia Commons haes media relatit tae Andrea Doria. Wikisoorce haes the text o the 1913 Catholic Encyclopedia airticle Andrea Doria. This page wis last eeditit on 27 Julie 2016, at 03:14.